Feel free to browse through these sites and check out some of the many products that we offer. See more styles and all the bells and whistles that KraftMaid “Consumers Best Buy” has to offer. View all DeWils Custom Style cabinetry and pick from traditional, frameless, or inset frame cabinetry. See the Exotic woods and finishes, and learn more about the attention to detail Hertco spends on your kitchen. Technistone® USA Quartz countertops that offer durability and low maintenance. With many choices of color, Caesar Stone offers strength, consistency, and beauty to your countertop. Corian countertops gives you the option of integrated Corian sink and coved splashes. Select your beautiful granite countertops and give your kitchen that touch of elegance. Select a wide range of tile for your flooring or counter needs. A variety of choices and selection from ceramic tiles to beautiful porcelain colors that can customize your counters and floor. Being a solid surface material, Meganite is stain resistant and it is also very sanitary. Wilsonart has tons of new laminate colors like Fusion, Roca and Oasis. Formica gives you the ability to have beautiful laminate countertops at a great price. Pick from a huge selection of kitchen and bath fixtures from vessel sinks to goose neck faucets. 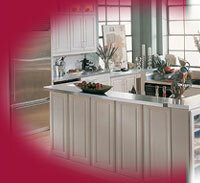 Tool Time can order your perfect sink and faucet to fit your new kitchen. Choose from 100’s of handles and knobs that fit your personality.